HedustMA is the new solo project of the well-known psytrance producer Hector Stuardo (AKA Ovnimoon) from Santiago, Chile. This project was born after Hector endeavored to find a deeper sound with trance elements and darker tones, less melodies and more atmospheres. In the beginning of 2016 Hector discovered some underground techno labels where he found the elements he was missing in modern trance music. It was a big surprise as he never thought that nowadays techno music has those elements. Immediately he started to compose similar stuff, trying out his own ideas. 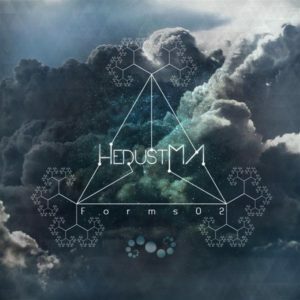 After receiving positive feedback from close friends he decided to create a new project, HedustMA. Spiral Trax released Hedustma’s first album, Forms 01, followed by more short-form releases on Utch, Iboga Record, and Lost In Ether. And now, HedustMa presents a new album, Forms 02, with both powerful and soft tracks, continuing the series of atmospheric, dark, and mysterious techno. Written and produced by Hector Stuardo. Mastered by alex.neon at Pureuphoria Studio. Cover design by Neomorph GFX. This release is also available on CD, please support the label if you like the music! MP3 Download | FLAC Download | WAV Download · Download count: 25,975. This release is a must-have ! Full support & CD bought ! Buenos sonidos profundos, muy bueno el proyecto. Great! Thank you for the excellent work! WOW!! Thank you very much Hector and Ektoplazm, absolutely love the HedustMa style !! defiantly proper quality dark underground techno!!! super super good! reminds me of the gear SNTS played in his boiler room set! that is also a must see if you like this type of music! Wahou, one of my favorite album of the month. I love to listen it watching buildings and transports in the project. I’m living in suburban of Paris (bobigny) and the sound are perfect for listenning in the subway or dark streets by night. Continue ! !